On September 1, 1963, during a visit to Frascati, Italy, less than three months after he had been elected Pope, Paul VI addressed the religious and civil authorities as well as the people of that city. The objective of the visit was to pay homage to St. Vincent Pallotti. Describing the time when he lived, which was after the French Revolution, Paul VI found a way to praise its principles as "Christian." 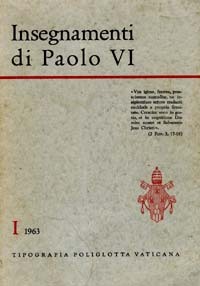 At right, the cover of The Teachings of Paul VI. 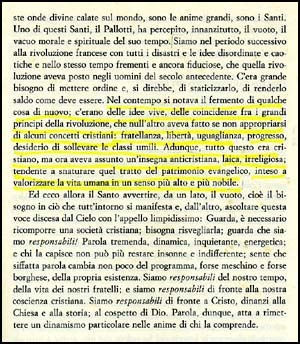 Below, we present our translation of the highlighted Italian text. At the same time, something new was fermented: lively ideas, coinciding with the great principles of the Revolution, which did nothing more than appropriate certain Christian ideas: fraternity, liberty, equality, progress, a desire to raise up the humble classes. In this sense, all this was Christian but had taken on an anti-Christian, secular and irreligious veneer, which tended to misrepresent this part of the evangelical patrimony destined to valorize, elevate and ennoble human life.